Lakers guard Kobe Bryant lit into the team, particularly D’Angelo Russell and Julius Randle, after Saturday’s loss in Portland. To the Lakers, the words sounded honest, critical and constructive as Kobe Bryant spoke. Bryant delivered a two-minute speech following Saturday’s loss in Portland, unloading a season-long worth of frustration with the Western Conference’s worst record, the team’s development and their attitude. Lakers rookie forward Larry Nance Jr. described Bryant’s post-game critique as “a very heartfelt passionate speech.” Lakers forward Brandon Bass said “he was cool with it.” Scott believed all of Bryant’s teammates “took it the right way.” And Scott predicted this could mark a turning point even if the Lakers (9-37) enter Tuesday’s game against the Dallas Mavericks (25-21) at Staples Center far removed from the playoff picture. But the main characters surrounding Bryant’s blistering critique did not address the issue. Bryant did not speak to reporters on Monday since he missed practice for maintenance purposes. Although he responded to the question in a friendly manner, Bryant declined to confirm or deny what he said to Los Angeles News Group on Saturday night. After Bryant singled them out by name in front of the team, neither rookie point guard D’Angelo Russell nor second-year forward Julius Randle spoke to reporters. Yet, the Lakers quickly mentioned both players already had previously scheduled appointments. Nance Jr. said that already started in Monday’s practice where the team followed through on their vow to improve their defensive communication. After all, part of Bryant’s frustration stemmed from the Lakers not following through on their game plan to trap Portland guards Damian Lillard and CJ McCollum, who combined for 64 points. Will Bryant’s message have more of a lasting impact? “It can. But it’s something you have to focus on everyday,” Bass said. “You can’t just say it one time and then let that be that. It has to be small detail things you have to focus one very day. Hopefully it’ll speed the process up. 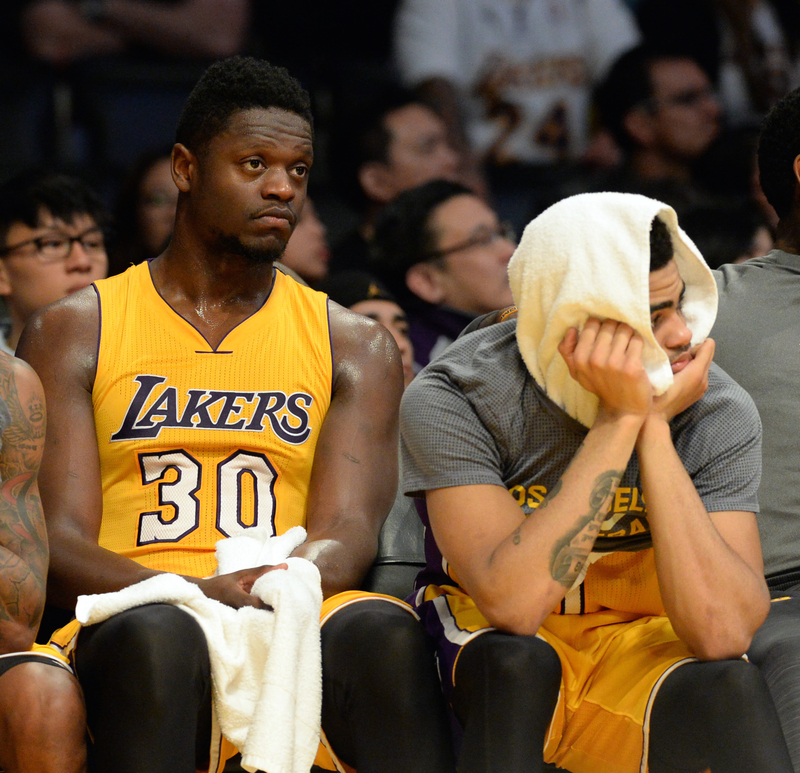 The Lakers have shown steady individual play from their young players in various ways. Russell has scored a combined 39 points on 16-of-22 shooting. Russell has shot at least 50 percent in three of the last four games, while also making 46.7 percent of his 3-point attempts. Randle ranks first in his sophomore class and ninth overall in total rebounds (431). And Clarkson has posted double digits in 23 of the past 24 games. Yet, the Lakers have not become satisfied with any of their defensive efforts. At various times, Russell and Randle also have shown frustration with both limited minutes and serving a reserve role for the past month. Though Bryant has averaged only 15.8 points on a career-low 34.7 percent shooting, he has tried to hold his team accountable in various ways. He has offered a first-hand glimpse of his recovery and practice regimen. He has pointed out various tactics on the floor during play. He has mostly provided positive reinforcement until Saturday’s game in Portland. Then, Bryant intervened during a team huddle in the third quarter amid frustration over the team’s effort. He then delivered another message in the locker room. After experiencing Bryant’s tough love last season that included a profanity-laced tirade during a practice, Clarkson openly wondered how the Lakers’ current team will handle his feedback.